I’m not afraid of the darkness. No kid is. Midwinter, the sun doesn’t rise, so it’s black all day. Perfect for hide-and-seek. I’m afraid of whiter things. In the distance, two dim shapes raise their snouts to the sound and sniff. On the second sniff, they turn in my direction. The story is set hundreds of years ago, but Iluak is a typical boy, with a boy's problems. He's annoyed by his little sister, ticked off by a boy he believes to be the local bully, and occasionally mortified by his female relatives. In other words, he's an authentic character kids will relate to. All children have fears to overcome, and will understand Iluak’s struggle to come to terms with his fear of the Bear. One skill I very much admire in Sandy Fussell’s writing, is her ability to tap into kids’ hearts, and what they will find funny. Any boy will understand Iluak’s problem in Chapter One. He needs to pee, but he shares an ice room with his family. Despite the danger, he prefers to avoid his sister’s giggles, and go out onto the ice to relieve himself. Throughout the book, we feel the maelstrom of emotions felt by a boy on the verge of manhood: love, fear, embarrassment, jealousy and bravado. Polar Boy works on two levels - it's a great read for both adults and kids. Fussell targets children with the readability of the text: uncomplicated sentence structure, lots of action, excitement and drama. Yet as an adult, I was pulled into the story, too. The easy narrative worked to strengthen Iluak's point of view for me. I was inside the head of a boy from a 13th century polar community, listening to his thoughts, and looking at the world through his eyes. Fussell's use of present tense makes everything more immediate; we feel every minute of Iluak's confusion and disorientation after a near-death experience. Iluak is a believable hero. He is a real, loyal and generous friend. He is afraid, and tormented by his fear. Yet as the story progresses, we see him mature, and learn to trust his own judgment, and fulfill his destiny. Nana’s words stick in your throat like the bones of an ice fish. Fear rushes through me like freezing sea water as Bjalki’s roar rises on a wave to batter our ears. I love fiction that has been so meticulously researched, it teaches without the reader noticing. Children who walk a mile in someone else's snowshoes, are learning tolerance, and a greater understanding of the world. This book has many positive messages: About fear. About the importance of friends and family. About the real nature of courage. 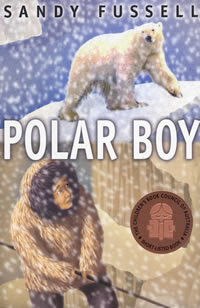 Polar Boy combines the merits of literary fiction with those of genre fiction - a darn good story told by a master storyteller. As a follow up to reading the book with your kids, you might like to use some of the Walker Books activities, or those from Fussell's own website. I found a great BBC video about a boy learning to build an igloo. If your preschooler wants to join in with some polar activities of his own, try this polar bear mask, or some arctic animal facts at Nick Jr.com.